What is a dental prosthesis? When a patient has lost teeth, a possible option is to use a dental prosthesis to replace them. A dental prosthesis is an artificial replacement for natural teeth and can be used to improve the appearance of the mouth and help with chewing and speech. Dental prostheses can replace one or more teeth and there are different types suitable for different cases. What types of dental prostheses are there? At Barcelona Dental Studio, our team specialises in esthetic dentistry and dental prostheses and we have many satisfied customers. We offer each patient a personal consultation to make sure they are fully satisfied before and after esthetic treatment. Trust the professionals, do not leave your health and your smile to chance. There are two main types of prosthesis, fixed or removable. A removable prosthesis can be taken out and put back into the mouth simply and easily at any time. This type of prosthesis is comfortable, inexpensive and esthetically pleasing. Full porcelain crowns are the most attractive form of prosthetic reconstruction and are used to replace teeth that have lost a large amount of dental structure in areas that the mouth that affect the look of the smile. Full porcelain crowns are often known as porcelain caps or ceramic caps. This type of esthetic prosthesis is hard wearing enough to protect the tooth being reconstructed, while giving very attractive, natural results. 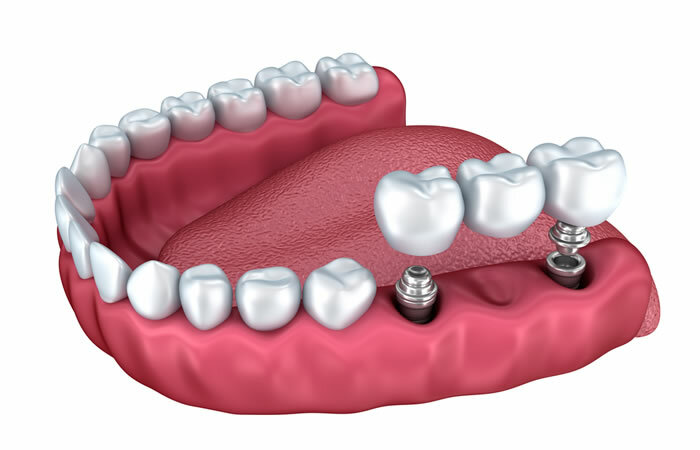 Fixed prostheses are cemented to the crowns of the teeth that have previously been prepared or can be screwed on dental implants. In this case they can only be removed by a dentist. What type of removable prostheses are there? Removable full denture: The removable full denture or more commonly called dentures are used in patients who do not have any teeth to replace the missing teeth of an entire dental arch, this is the most economical method available to replace natural teeth. They are made of resin and perform the same functions as natural teeth. One of the advantages of removable full dentures is that they can be removed by the patient without the help of the dentist and sanitized. Partial removable resin prosthesis: These prostheses are used in patients who still have a tooth in their mouth, so that the prosthesis will have greater retention. This type of prosthesis is usually used temporarily or when the natural teeth that remain in the mouth are severely damaged. Removable or skeletal partial prosthesis: This type of prosthesis is used both in teeth and in the oral mucosa, and is used in patients who retain natural teeth in the mouth, consist of a metal base and offers us a higher quality than partial resin prosthesis. Dental crown: A dental crown is a restoration that is placed over the previously milled natural tooth (left smaller) in order to protect it and give better functionality to the teeth, which are fixedly cemented and permanently attached to the tooth. Dental bridge: The metal bridge is used to replace at least the absence of a tooth, is made by grinding the teeth near the edentulous area and placing the crowns attached to the prosthetic piece that will cover the space of the edentulous area. Implant-supported prostheses: This is a type of fixed prosthesis which, instead of being supported by natural teeth, are attached to dental implants. This type of prosthesis can replace anything from a single tooth to a full arch. Removable prostheses as opposed to fixed prostheses are a more economical treatment. When it comes to sanitizing the prosthesis or brushing your teeth, removable prostheses can be a much more comfortable method, as they have the characteristic that you can remove them from your mouth. On the other hand, fixed prostheses are more durable, and even though they are more difficult to sanitize, they retain less plaque than removable prostheses. Complications may be more difficult to treat with fixed prostheses than with removable prostheses, but they involve less maintenance, as well as more security for the patient, since he or she is not at risk of losing it or dropping it. Fixed dentures are the ideal choice for patients who have few teeth missing, both for comfort and aesthetics, in addition to having multiple types of fixed dentures.